Where we meet as God's people of joy! St. Stephen’s has a long tradition of lay-leaders sharing their gifts of vocal music with the congregation during worship. 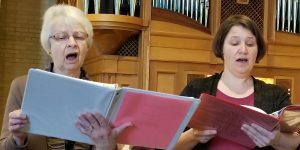 The cantor’s primary role is to act as a song-leader during worship, which can involve leading the psalm and the “assisting minister” or “leader” parts for any liturgical music or hymnody. Cantors may act alone or as a group, and also have the opportunity to offer solo or small group (duets, trios, etc.) music during the worship service, as seasonally appropriate and necessary to the service. To be included in the roster of available cantors, submit your name via the form below. Copyright © 2019 St. Stephen's Lutheran Church, ELCA.